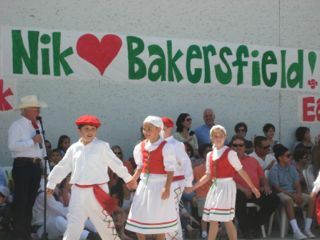 Festival-goers in Bakersfield this weekend were asked what brought them to the festival and what they most appreciate about being Basque. Their stories are modeled after the popular website Humans of New York. 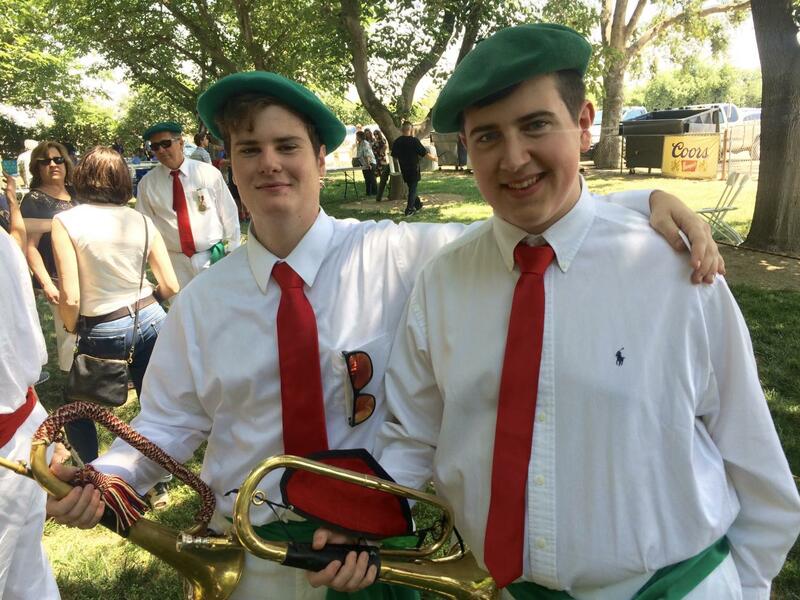 Pampi Etchechury, of Fresno, Calif. and Dominic Lesaca, of Bakersfield, Calif.
Pampi Etchechury and Dominic Lesaca both played the bugle in the klika for the Kern County Basque Festival. Etchechury noted that his father “skipped out of teaching me the language,” but he still practices his culture by dancing in the Fresno dance group and with San Francisco sometimes. And he plays with the klika at different festivals. 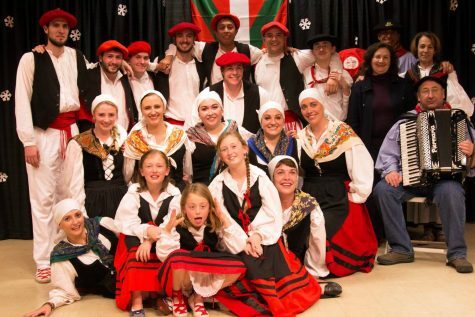 “You don’t have to be born in to the culture to be part of the culture,” said Etchechury, who says he even has friends who are not Basque who enjoy the cultural activities. Buy the video previewed here for $15. Call (661) 303-7616 or e-mail video@bak.rr.com. 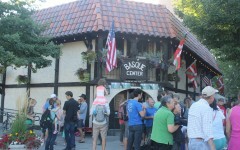 “Being Basque is kind of like having the ability to share experiences with other people and have a base connection with them,” said Lesaca. 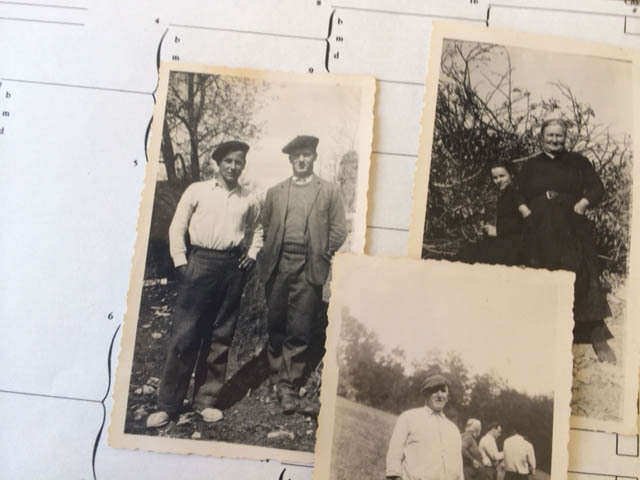 “Even though people don’t speak the language any more, many other avenues have been created to connect,” he added, such as playing in a klika, playing mus and dancing. 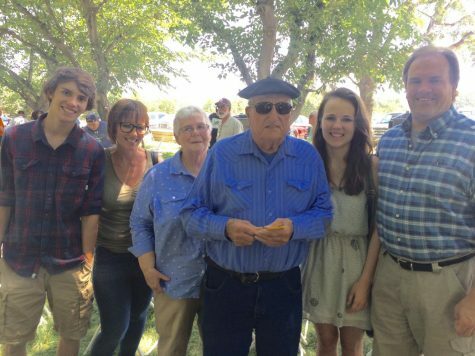 The Jones and Lahargou families: (l. to r.) Jean Pierre and Betty Jones, Emalyce and Pierre Lahargou, Linzi and Nelson Jones at the Kern County Basque Festival 2017. 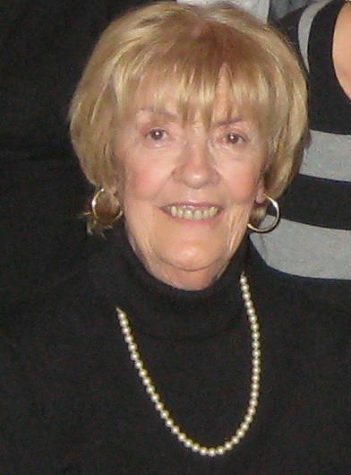 Betty Jones is originally from Paso Robles, California and she planned a trip from North Carolina back to California with her family to coincide with the Bakersfield festival. 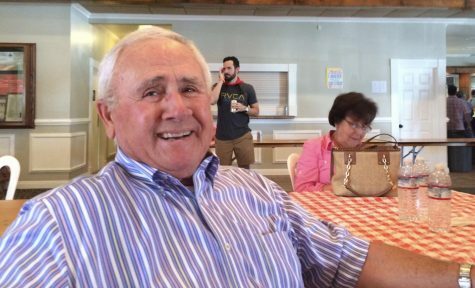 “When I was young, we came every year and I just loved it.” Her father, Pierre Lahargou, runs Lahargou Farms in the Paso Robles area, with members of his extended family. Jones, her husband, and their two children were enjoying a family reunion at the festival. 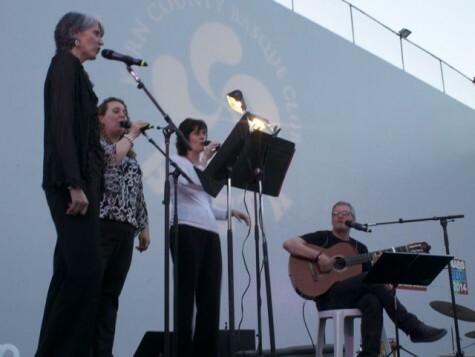 “I want to help the kids understand what being Basque is,” she explained about why she brought Jean Pierre, 19, and Linzi, 20, such a long way for a festival. 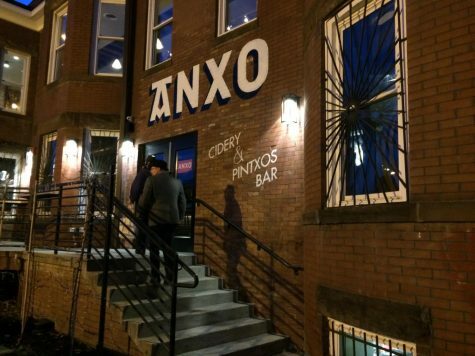 “I love the dancing, the food and the people,” said Jones. 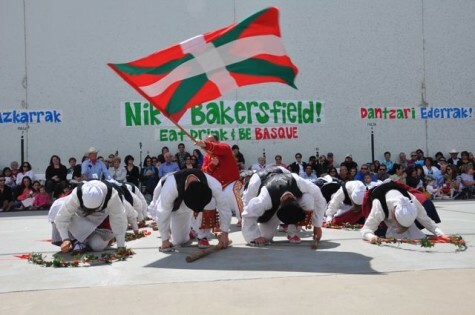 “They’re such a close-knit group,” she said, about the Basques. 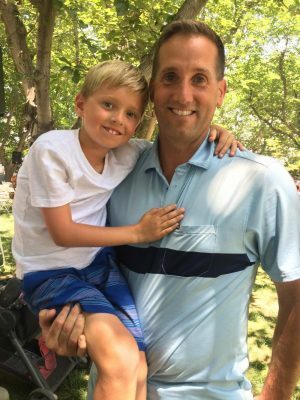 Marc Heguy, of Los Banos, Calif.
Tony Laxague and his son Antton at the Kern County Basque Festival 2017. 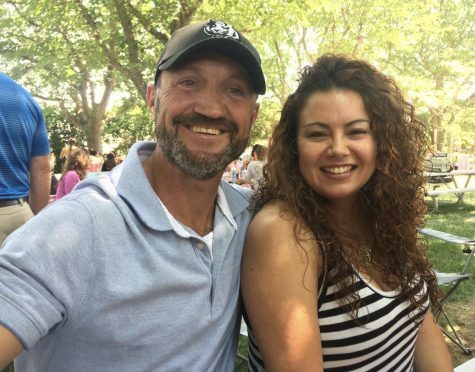 Tony Laxague of Burlingame, Calif.
Laxague, who is from the San Francisco Bay Area, was at the Bakersfield festival with his family because his wife is from Bakersfield. Both of Laxague’s parents are from the Basque Country, and he speaks Spanish and Basque, in addition to English. He joked that he speaks “Basqlish” with his parents. 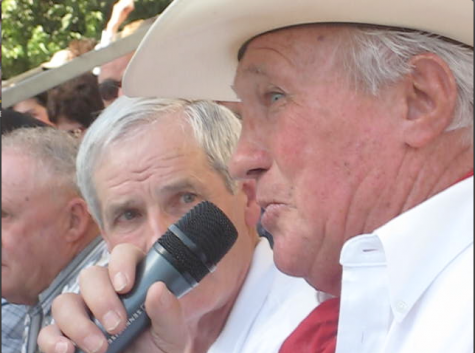 Bernardo Vidaurreta with his wife Cathy in the background at the Kern County Basque Festival 2017. 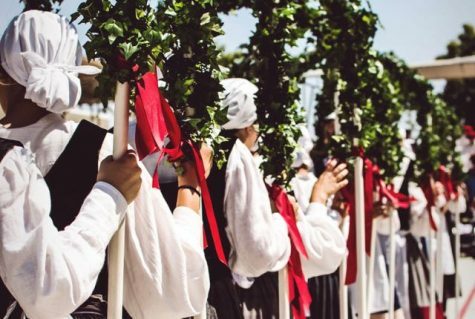 Bernardo Vidaurreta, born in the small Basque town of Esnotz, in Spain, says he’s proud to be Basque, ”even though I don’t speak Basque” — a fact he laments. “My grandparents could hardly talk Spanish,” he remembers. But Vidaurreta was born in 1934 during the Spanish Civil War, and Dictator Francisco Franco was fiercely anti-Basque. 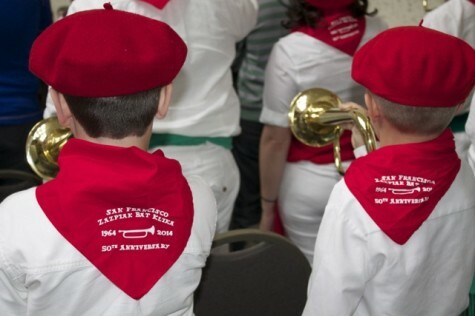 “They were afraid,” said Vidaurreta of his parents’ refusal to speak Basque to their children. 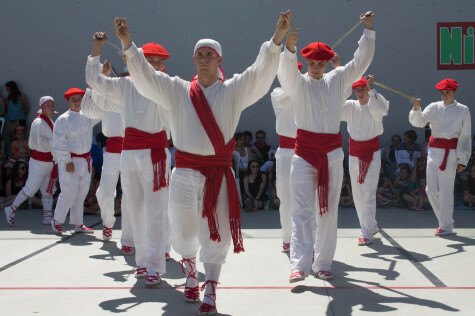 “Even my cousins spoke Basque” said Vidaurreta. 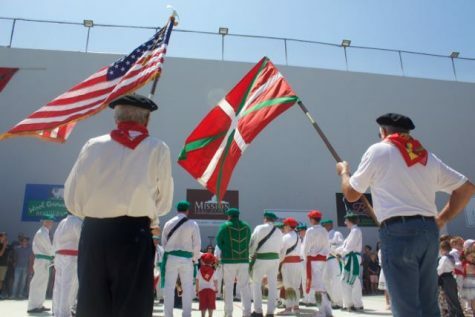 “I couldn’t talk to them.” The teachers at his school were all Spanish “None of them were from our area,” he said, which he believes was part of Franco’s campaign to stamp out the Basque culture. Despite being born in such a historical period, Vidaurreta doesn’t remember anything about the Civil War nor World War II because he was so young. He does remember however when a bomber crashed down near his town in 1943 or 1944. “I was guarding the cows and I saw a big explosion.” The bomber crew was English and no one could communicate with them. Luckily an older man had spent some years sheepherding in the US and could speak English. “The first thing they wanted to know was whether they were in Spain or France. They were happy they were in Spain,’ he remembers, because the Germans were bombing France and they could have been captured by the Germans. So sorry I missed all that fun! Hopefully, I’ll be there next year. My father is from Esterençuby, near St. Jean Pied De Port. Best wishes to all!! !